Reference number for this case: 16-oct-54-Issoire-le-Broc. Thank you for including this reference number in any correspondence with me regarding this case. Dans l'Ille-et-Vilaine, in Paramé, a plaster stated to have seen Saturday evening, around 07:45 p.m., two luminous discs which went up and went down in the sky at an extraordinary speed. A third luminous disc seemed to follow a line parallel to the horizon, at a much slower pace than the two others. The discs, while moving away, left behind them a tail similar to that of a comet. This magazine indicates that in Issoire-le-Broc in the Puy-de-Dôme, personnel of the airfield, and chief pilot Hébault, in flight, observed a craft of circular shape which hovered for nearly two hours before slowly moving towards the West. Luc Chastan indicates that in the "Puy de Dômes" in Issoire on October 16, 1954, at an unknown hour "The personnel of the airfield and a chief pilot at this time in flight there observed a shining object of circular form that hovered during nearly two hours at very high altitude before moving slowly towards the west." He indicates that the source is: "Le Provençal"
The sighting is undated, however the newspaper article was issued on October 18, 1954. As by coincidence, it is called "Aéroclub Pierre Herbaud", there may be a relation with "chief pilot Hébault." [lp1] Article in the regional newspaper Le Provençal, Marseille, France, page 8, October 18, 1954. 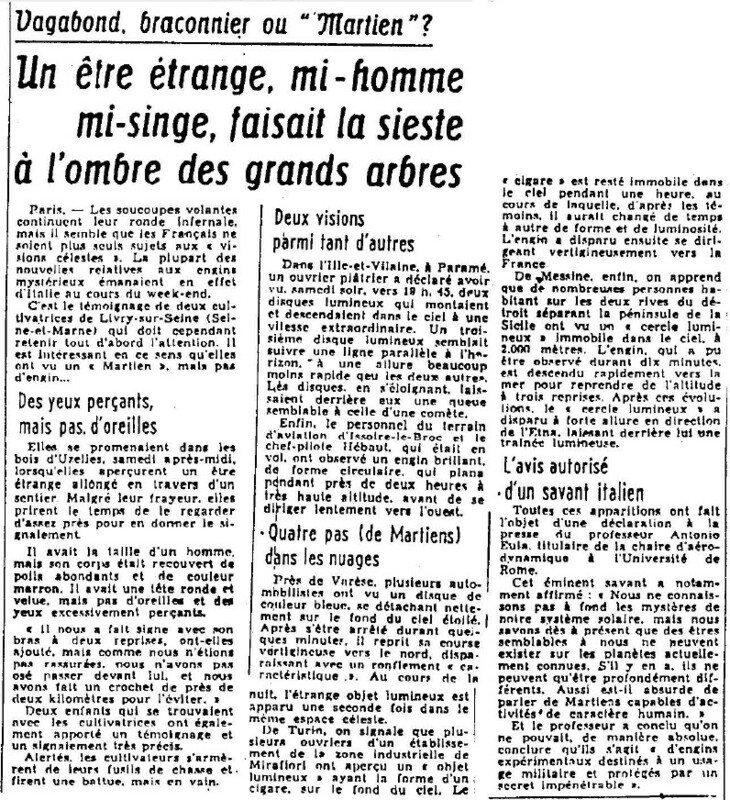 [---] Article in the regional newspaper La Dépêche du Midi, France, October 18, 1954. [ld1] "Les archives de 1954 pour le Puy-de-Dôme", article in the ufology magazine Lumières Dans la Nuit (LDLN), France, #125, page 27, May 1973. 1.1 Patrick Gross May 30, 2010 Addition [le1]. 1.2 Patrick Gross February 29, 2017 Addition [ub1].